If there were any concerns that the lack of a prep race could affect Quevega’s attempt for successive victories in the David Nicholson Mares’ Hurdle, it was swiftly put to bed in the race itself. Jockey Ruby Walsh always had plenty of horse underneath and cruised into the lead at the business end of the race. Quevega’s victory brought Walsh his 25th Festival victory to equal the record of Pat Taaffe, famous for his exploits on Arkle. “Ruby gave her a confident ride. She jumped so well early on that he was afraid she might catch the top of one so he put her back a little bit,” said trainer Willie Mullins. The mare has had a difficult year since last season, suffering a hind-leg suspensory injury in Auteuil. “It was very bad and we debated whether we would put her in foal, but it was too late so we thought we’d have one go at trying to get her ready to run here and we banked everything on having her ready for today. We couldn’t school her because the veterinary advice was not to jump her too much. “I was nearly going to run her in Gowran, but she scoped badly and the ground was heavy anyway so I thought I might leave it,” said Mullins. “She did a fantastic piece of work last Tuesday and then Ruby rang me up to check saying the reports in England last week were that she’d only got three legs. “God knows where the rumours came from. The one horse we did pull out, Mourad, there were no rumours at all,” he added. Mullins suggested that the mare’s next outing would be at Punchestown, in the Rabobank Champion Hurdle, in which Quevega finished third last year. Although she proved no match for runaway winner Quevega, the Nicky Henderson-trained Carole’s Legacy continued her upward career path when finishing second in the Grade Two David Nicholson Mares’ Hurdle. Paul Murphy, who owns and bred Carole’s Legacy, called for a championship mares’ chase to be added to the race programme. Jockey Ruby Walsh is now the joint most-successful jockey of all-time at The Festival following his victory on Quevega, who was recording a second successive victory in the David Nicholson Mares’ Hurdle. Walsh has now ridden 25 winners at The Festival, equalling the record set by the late Pat Taaffe. With a book of rides later this week that contains the likes of Master Minded, Big Buck’s and Kauto Star, it looks highly likely that he will break Taaffe’s record. After his winning ride on Quevega, Walsh said: “It’s always great to get a winner on the board, especially on the first day as it relieves a bit of pressure. 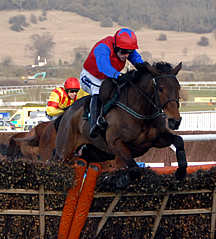 “I thought Quevega was my best ride today by far - she really is the best mare around when she is on song. “She was beaten twice after winning here last year - in France she just didn’t fire and she was third at Punchestown behind Solwhit and Punjabi so you would have to say that’s in fair form. 1. This year sees the third running of the Grade Two David Nicholson Mares’ Hurdle, named in memory of the legendary Cotswold-based jockey and trainer, who passed away in August, 2006. 2. “The Duke” enjoyed five successes at The Festival as a jockey between 1963 and 1973, but is best known for his 17 victories as a trainer, including successes in the Seasons Holidays Queen Mother Champion Chase (1994 & 1995 Viking Flagship), Ladbrokes World Hurdle (Anzum 1999) and totesport Gold Cup (1988 Charter Party). 3. Nicholson became the first trainer for more than 50 years to saddle three winners in a day at The Festival when Putty Road (Ballymore Properties Novices’ Hurdle), Viking Flagship (Seasons Holidays Queen Mother Champion Chase) and Kadi (Racing Post Plate) all triumphed on March 15, 1995. 4. The first running was won by Whiteoak, trained by Donald McCain, who prevailed by a short-head from Refinement in a thrilling finish.